That was why I called that post ‘one vote to bind them all’. The second sentence is just nonsense, while the first is ominous for any democrat. But as both polls and focus groups suggest, the spin that she needs ‘a strong mandate to get the best Brexit for Britain’ chimes with many voters. It is a vote to 'bring them all' into the darkness of an endeavour the aims of which remain hidden by platitudes. In this rather odd sense, there are similarities with what the Falklands did for Thatcher. The negotiations have been portrayed in the UK media as a battle between the UK and the EU. It is only natural for this to inspire nationalism among many voters: May needs strong backing (a large vote) so she can get the best deal for Britain in her battle with the EU. (And, of course, anyone arguing for the EU is therefore a ‘saboteur’.) May’s election announcement bounce therefore has similarities to Thatcher’s Falklands poll bounce. As ever, reality is very different. What happens in the negotiations is largely down to the EU, with the occasional choice for the UK. These choices should be made by democratic means, and not by one person who has the interests of her party to worry about. My impression is that as far as the media outside the UK is concerned they just cannot understand why we have embarked on this crazy path. If May and her team realised this when they called an election they were clever. There are plenty of other reasons why she called an election: potential prosecutions associated with election expenses, as Bill Keegan’s notes the negative impact of brexit is about to become visible, and of course the unpopularity of JC. The latter was, I’m afraid, inevitable from the moment he was re-elected, and the responsibility for that vote lies as much with the PLP as with Corbyn and Labour party members. It is almost as if May’s line is ‘who do you want to lead us into battle, me or JC’? With the referendum still regarded as the most important issue in UK politics, it is a line that could make the UK into virtually a one party state. Of course many die-hard Remainers (like me) will never vote for her, but they comprise at best only around half of the 48%. Labour’s core support will remain loyal. But even if you could form some kind of ‘progressive anti-May alliance’ (which will not happen), Chaminda Jayanetti is right that there just are not enough progressives around to defeat the Conservatives, particularly if the UKIP vote collapses. So is a Conservative landslide which decimates Labour assured? Heroic talk of defeating May and trying to shift the debate on to something else besides Brexit will not work. This is not because the Tories are not vulnerable. Quite the opposite in fact: I have never known a government that has such a poor record on health, education (this, and grammar schools for pity’s sake) and even prisons. The ‘we now have a strong economy’ line is a lie just waiting to be busted. All that means the Conservatives will focus relentlessly on Brexit and leadership. In 2015 the broadcast media followed the press in focusing on the issues where the Conservatives were strong, and they will do so again with (unlike 2015) justification from the polls. Perhaps predictably, the wisest words I’ve seen written on this have come from Tony Blair. He suggests the slogan ‘no blank cheque’. It concedes defeat, which is realistic and has the advantage of shifting attention away from JC’s leadership qualities. It encourages voters not to ask who would be best battling for Britain against the EU27, and instead to think about choices to be made which may not be in the country’s interests but instead are in Conservative party’s interests. I do not think the leadership will ever adopt this line, because it requires them to admit they are going to lose and I do not think they are brave enough to do that. But on the doorstep it might help. When I tweeted Bill’s column with this point about Corbyn, someone replied that I couldn’t help making a dig at Corbyn when the price was a Tory Brexit. This is the other side of those on the right who accuse me of being politically biased when I’m critical of the government. Both misunderstand what I do and don’t do. I don’t do propaganda as defined here. The culture war analogy that Chakrabortty uses is interesting, as is the comparison with Nixon. But in many ways it is the spin doctors, well versed in what happened in the US, who are calling the shots, and May just has to agree to what they advise. 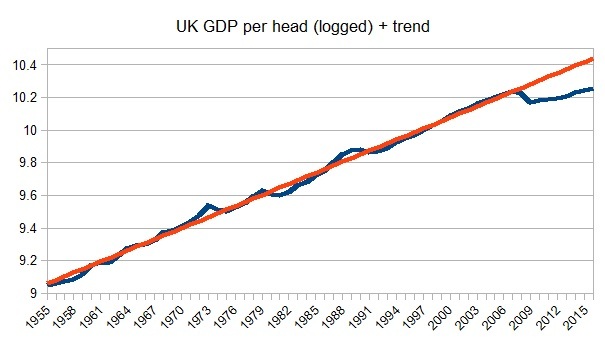 My last post was designed to show clearly that the UK has not been a strong economy since the Conservatives started running it. Now I would be the first to say that this proves nothing about how competent the Conservatives are. It may be just bad luck. My point was about the media debate. This should be about whether it is the government’s fault that we have a weak economy, or alternatively whether they have done the best they could in the circumstances. Instead of that discussion, we have mediamacro’s presumption that we have a strong economy when clearly we do not. The political debate should really be about economic competence. Mediamacro assumes that the Conservatives are more competent at running the economy because that is what the polls say, and the polls say that in part because mediamacro assumes it. It is a self-reinforcing loop, where the last thing the media thinks of doing is asking academic economists. How would I, as an academic macroeconomist, assess competence when it comes to running the macroeconomy? The obvious thing to do is to look at key macroeconomic decisions made by governments, and how they turned out. I would be particularly hard on governments when they chose to go against the prevailing academic consensus, and this choice did not turn out well. I have written about this before on a few occasions: see here and here for example. Let me summarise why I think, once again, it is the Conservatives rather than Labour who have a lot of explaining to do. We can start with monetarism, which in its most basic form is setting policy according to movements in monetary aggregates (the ‘money supply’). It was a short lived failure. A particular failure was the 1981 budget, raising taxes in the middle of a recession, which was famously opposed by 364 economists. The economists were right: the recovery (properly defined) was delayed by 18 months. This is not the story told by mediamacro, but it is an account that fits the facts. The next economic disaster was the Lawson boom of the late 1980s, which combined a monetary and fiscal stimulus that increased inflation. I was once told by someone close to decisions at the time that Lawson wanted to reduce the top tax rate to 40% in 1988, and it was thought to be politically expedient to combine this was a standard rate cut even though we were in the middle of a boom. Monetary policy involved shadowing the DM, so could not counteract the fiscal stimulus and other inflationary pressures. By 1990, the Lawson boom was becoming a recession, and the Conservative government decided to formally fix the exchange rate. Their chosen rate was much too high, as the work I carried out with colleagues at NIESR clearly showed. Black Wednesday, when the UK was forced to abandon the fixed exchange rate regime, rightly lost the Conservatives their reputation for economic competence for some time to come. Between 1992 and 1997 the management of the economy was better, but without any major decisions or events. Widening the definition of policy you can justifiably credit Thatcher with weakening trade union power, but her failure to emulate Norway and establish a sovereign wealth fund from North Sea Oil revenues was a clear mistake. Under Labour there were three major macroeconomic decisions, and all three were successes. First most academics agree with central bank independence, and I think most would agree that the design of the Monetary Policy Committee in 1997 was particularly good. Second, the decision not to join the Euro in 2003 was clearly correct, which was taken after extensive economic analysis. Third, the decision to embark on fiscal stimulus after the Great Recession was correct, in much the same way as Obama’s slightly later stimulus was correct. Should we count the financial crisis, and the failure to prevent it happening, as a clear negative against economic competence? I would argue not, as (a) the opposition argued for less financial regulation, and (b) the government did follow the consensus view at the time. If any institution is to blame, it is the Bank of England for ignoring the rise in bank leverage. As to a profligate fiscal policy, this is simply a myth. The incoming coalition government set up the OBR, which deserves credit just as setting up the MPC under Labour does. However their decision to embark on austerity in 2010 was a huge mistake, which once again probably went against majority academic opinion, particularly as it involved cutting public investment sharply. And then we have Brexit. Although arguably mandated by a referendum, the decision to leave the Single Market and customs union are down to the Conservative government alone. We will be able to compare the economic policies of the two parties this time when they publish their manifestos. This post is about track records. It shows clearly that Labour tend to get things right, while the Conservatives have created a number of major policy-induced disasters. As with the ‘strong economy’, mediamacro have got it completely wrong about macroeconomic competence. But I’m afraid, as was the case in 2015 and 2016, it will be mediamacro rather than reality that carries the day. That, alas, is how democracy currently works in the UK. My last post talked about the gap between the macroeconomic narrative in the UK media (‘mediamacro’) and macroeconomic facts. The gap is created or encouraged to a considerable extent by narratives employed by the political right. So how might that change, to let reality back in? As with other things, Labour under Miliband had the right idea but did not follow it through. They talked about a ‘cost of living’ crisis, but in doing so they implicitly suggested this was some unfortunate by-product of a strong economy. The aim should be to redefine a strong economy as one that delivers solid real wage growth. To do so makes perfect sense in current circumstances, when we have just had a policy-induced large depreciation in sterling. GDP measures the output produced in the economy, but not how much people in that economy can buy. Welfare depends on the latter, not the former. I have stressed in the past (including my last post) how weak recent UK performance has been by historical standards. But a favourite trick of the government is to make international comparisons, of GDP rather than the more appropriate GDP per head. So how does our economy look if we focus, more appropriately as I argue above, on international comparisons of real wage growth? Luckily the ILO and Geoff Tily have already done the spade work. Here is a chart for all countries, with blue denoting OECD countries. Among OECD countries the answer is striking: only Greece has seen real wages falls greater than the UK. The UK is second best among the OECD at achieving a decline in real wages! Geoff looks at data from 2008, but a quick check suggests the result holds good if we start in 2010 instead. The data in this comparison only goes to 2015. You could, rightly, argue that 2016 was a better year for the UK, but then you would have to address what will happen to real wages this year and next. You could argue that this poor performance was a consequence of the 2008 depreciation (which had lagged effects): again you would be right, but the Brexit depreciation which is not yet in these figures is just as large. Either way this data provides strong evidence of just how terrible UK economic performance has been over the last several years. What is more, unlike GDP, it is data that directly relates to the experience of ordinary people. But as Miliband found out, to quote this data is not enough. 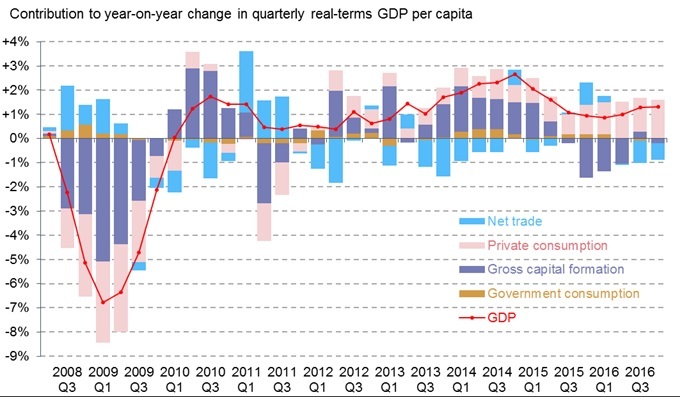 What you need to do is start proclaiming that the UK economy under a Conservative Chancellor has performed worse than any other OECD economy besides Greece. Just that, no caveats, no qualifications, no ‘cost of living’ label. Only that way will you begin to shift the narrative that we have a strong economy. If you are worried that this might help justify calls to reduce immigration, fear not. What they show is that policymakers failed to create an adequate level of aggregate demand: another consequence of austerity. It has even been fact checked: see here. In 2015, the Conservatives spun the line that Labour profligacy had messed up the economy, and they had no choice but to clear up the mess. In short, austerity was Labour’s fault. As Labour chose not to challenge this narrative, almost all the media and half the voters assumed it must be true. The reality was the complete opposite. The rising deficit was a consequence of the global financial crisis, not Labour profligacy. Doing something about it should and could have been delayed until the recovery was underway. By acting prematurely, Osborne delayed the recovery and lost the average UK household resources worth thousands of pounds. The story that we had to cut now because of the markets was completely false. Indeed, if you define the term economic recovery properly, as growth above previous trends, there has been no economic recovery from the Great Recession. I have shown this chart many times, and the story it tells is clear. In every post-war recession the economy recovered. The exception is this one, where we have seen no recovery while Conservatives were running the economy. We can put the same point another way. The average growth in GDP per head during the Labour government period, which included the recession caused by the global financial crisis, is greater than average growth since 2010. The last decade has seen a unique period of falling real wages. Now this might not be the fault of the government in charge at the time, but it is that government that should have some explaining to do. But they never do have to explain, because mediamacro take it as given that the Conservatives are better at running the economy. The 2015 General Election was the first recent occasion that the economic facts were ignored. The second was of course the EU referendum. Academic economists were united in thinking that Brexit would be bad for living standards: the only question was how much would incomes fall. The non-partisan media decided to portray that not as knowledge, but as just another view, to be always matched by someone saying the opposite. A critical issue during the referendum was a belief that immigration had reduced the access of UK natives to public services. Economists know that is simply wrong for the economy as a whole, and if it happens locally it is because the government has pocketed the taxes immigrants pay. But the media did little to inform voters of why it is wrong, and I suspect this is why most of those voting Leave believed they would be no worse off in the long run outside the EU. This majority were not willing to lose income to reduce immigration for the simple reason that they believed, erroneously, that reducing immigration would make them better off. Brexit may not have led to the immediate economic downturn that some expected, but the Brexit depreciation has brought to a halt the short period during of rising real wages. The economic pain that economists said would follow any vote to leave is starting to happen. Will that change the broadcast media’s view about how to present the economic consequences of Brexit? When Conservative politicians and their media backers choose to focus on GDP, will broadcast media journalists have the nous to ask what about real wages? Unfortunately we know the answer to these questions. As far as economics is concerned GE2017 is likely to be nothing more than a combination of GE2015 and the EU referendum. The economy has not got any better than in 2015, and is about to get worse, but mediamacro will let Conservatives insist that the economy is strong. It is one year on from the referendum, but we still do not know what kind of Brexit we will have, a reason May gave for not holding another referendum in Scotland. The exchange rate has fallen and real wages have stopped rising, but we will still be told this is just Project Fear and the consensus among economists will get ignored once again. So, for the third time, we will have a vote where economics is critical but economic facts will be largely ignored. We might be appalled at the authoritarian way May justified her decision to hold an election, which the Mail only slightly beefed up in their Leninist talk of crushing the saboteurs. But the depressing truth is that a majority of voters have bought this story. According to a snap poll by ICM for the Guardian, 54% of voters thought May was right to change her mind about an election because the situation has changed. They have been sold the narrative that Brexit is the will of the people, and now they must get behind May so she can get the best Brexit deal. As inflation rises and real wages fall the facts may be changing, but the narrative survives. Narratives are a way people can try to understand things they know little about, and most people know little about economics or politics. Mediamacro is a set of narratives. Project fear is a narrative. The right and the ideologues are very good at selling narratives, and they have a media machine to invent them, road test them and spread them. The left and the realists have none of those things, and are hopeless at it anyway because they know reality is more complex than most narratives. That is why they have lost two elections, and look like losing a third big time. Now of course this point is irrelevant if we are talking about reducing poverty by taxing the rich. The rich are a very good source of money, because they will not miss it very much. The importance comes if we compare two societies. One has no poverty, but a significant number of very rich people. The other has no rich people, but still has poverty. Miles’s argument is that we should prefer the society with no poverty to the one with no super-rich. In a static sense I think that is right, but I have dynamic concerns that I will now come to. As I discussed here, the bonus culture may be the means of rent extraction that was incentivised by cutting top tax rates. If you want to see the kind of thing I have in mind in action, read this article by Ben Chu on what happened to Theresa May’s wish to see annually binding votes by shareholders on executive pay. That kind of lobbying takes effort. It worked, and as a result top executives at the builder Crest Nicholson can ignore a shareholder vote against changes to their compensation rules. No wonder executive pay seems to rise even when a company’s fortunes turn sour. Of course status linked to competitive consumption is also important. A few days ago I took part in a Royal Economic Conference session on the implications of the Brexit vote. There is no need for me to describe how it went, as there is a good write up in the FT. By good, I mean that it was a fair reflection of what went on. Philip Aldrick, economics editor at the Times, took exception to something I said at the meeting on twitter. Almost a month ago I wrote a post on propaganda. I used a definition borrowed from Jason Stanley, where intent was key. A good journalists provides what they believe are they key facts that the reader needs, while propaganda involves providing facts that advance the newspaper’s view. The interesting thing about this twitter conversation was that Aldrick thought that selecting facts to support the papers view was not propaganda, and that he thought it was what the other newspapers he named and I as an academic did. “EU migrants of working age living in the UK who do not have a job account for a city the size of Bristol, new figures have revealed. One in seven of the 2,733,000 EU migrants aged 16-64 - a total of 390,000 - are unemployed or “inactive”. The ONS survey can be found here. The fact that the Telegraph chose not to report was that 1 in 5 UK nationals was unemployed or inactive (excluding students). The reason that this is such a high figure is that ‘inactive’ includes mothers staying home to look after children, another fact that the Telegraph decided not to report. The real story therefore is that migrants of working age are more likely to be working than UK nationals of working age. Other things being equal, this means that they will be paying more taxes and therefore contributing proportionately more to public services that UK nationals. By selecting which facts to report to their readers, the Telegraph turned this into a story about how many migrants were not working, and the amount of benefits they were collecting. In doing this, they were following in the proud traditions of the Mail, Sun and Express. Would you call this journalism or propaganda? There are a great many good journalists who would not want this described as the same as what they do, and it fits the definition of propaganda I gave exactly. Propaganda distorts the truth, and in a country like the UK good propaganda does not need to resort to lying about facts to achieve its goal. And of course it matters a lot. I suspect that stories like this are one of the reasons the state can treat migrants so badly in this country. Henry Farrell has an article in the Washington Post that links a forthcoming paper by him and John Quiggin with a debate that several bloggers have been involved in over the role of academic economists in promoting (or otherwise) austerity. The paper is very rich in historical detail, but the line he takes in the article is that politicians went with fiscal expansion when economists appeared united in their advice, but the switch to austerity began when economists appeared more divided. I tend to agree with Kevin Drum in this: he says that basically politicians did what they wanted to do, and economists were simply used to provide some kind of cover for politicians’ decisions. This is the argument I make in my General Theory of Austerity paper. The clearest case of this is probably the UK. George Osborne opposed the fiscal stimulus in 2009, and what changed is that he became Chancellor in 2010. So in this case there was no change of view, just a change in who was in power. The example which fits Farrell’s case much better is Germany. He argues that German politicians were persuaded to conduct stimulus in 2009 by the (surprising) unanimity of their own economists, but switched to austerity when German economists reverted to type. On this he may be right. But even here I think you can tell a different story, which stresses what politicians were most afraid of. In 2009 they were (rightly) concerned that we might be seeing another Great Depression, and so their instinct was to follow their economic advisors who had exactly the same fear. By 2010 it appeared that this fear had been averted, and now a new concern (for both politicians and austerity inclined German economists) arose over European debt. In the case of Germany, therefore, the story is one of ‘events, dear boy, events’. In the US and UK it was that Republicans and Conservatives gained enough power to enact the policy they wanted to implement all along. The policy was what I call deficit deceit: reducing the state using fears about the deficit as a pretext. You could perhaps argue that the Treasury and the Governor of the Bank encouraged George Osborne, but I think he would have done it anyway: he was never one to let economics get in the way of achieving a political goal. But as Drum says, it is not all gloom for economists. To quote: “If we had responded to the 2007-08 financial crisis the same way we did to the 1929-32 financial crisis, we'd still be waiting for a rerun of World War II to pull us back to normal.” I get very annoyed when people ask me what economists have done to deserve respect over the last decade. We avoided another Great Depression, that’s all. It may have been politicians top priority, but we told them what needed to be done, as Farrell makes clear. But when Farrell suggests that austerity could have been avoided if only economists had stayed united, I think he is wrong. If you view 2016 as an experiment to see if policy can really ignore the united view of academic economists, the result is that it can. While it is important to hammer home what a mistake austerity was, and that it was never the policy recommendation of the majority of economists, the key question is why on occasion that often overwhelming majority can be so easily ignored on issues economists know more about than anyone else. When I wrote about why the BBC should treat a clear consensus in economics the same way as it now treated climate science, I got a number of comments about why economics is not a science. A common theme was that economics couldn’t prove theories ‘beyond doubt’ the same way as the hard sciences could. A more sophisticated version of this complaint is that most economic theories cannot be disproved in the same way that Popper thought scientific theories could be disproved. All this ignores a key feature of any social science, which is their inexact nature. Instead we have accumulations of evidence that confirm the applicability of some theories and reject the applicability of others. Economists’ views about what models are applicable change as this evidence accumulates. A good example involves the minimum wage, as Noah Smith suggests. The basic economic model suggested even a modest minimum wage should significantly reduce employment, but economists discovered that the evidence did not show this. As this evidence accumulated, alternative theories and models (monopsony and search) were thought to be more relevant. It is this response to evidence that makes economics a science. Jo Michell writes “The scientific method of forming a hypothesis and then testing that hypothesis against reality can never be the final arbiter of knowledge, as it can in the physical sciences.” He is right that no single experiment or regression can kill a theory, but wrong that the accumulation of evidence is not the final arbiter, because no other arbiter is available. He links to a post by Noah Smith which talks about the failures of forecasting. But as that post makes clear, this is not about data rejecting models, but the inability of models to predict the future. We would never dream of condemning medics because they cannot predict the exact time of our death, still less suggest that this failure indicates they are not doing science. Of course economics involves cases where economists appear too reluctant to give up their favoured models. You can find similar stories in the hard sciences. There will be more such stories in economics because the inexact nature of economics makes it easier to discount any single piece of evidence. What I cannot understand is what leads someone like Russ Roberts to argue against the use of evidence, and instead that “economics is primarily a way of organizing one’s thinking”. Astrology is also a way of organising one’s thinking, but it fails because evidence does not back it up. So thinking like an economist does not tell me at what point raising the minimum wage will reduce employment. But why would anyone want to keep their models from being proved relevant or otherwise by data? The only reason I can think of is that some models give answers that are ideologically convenient. Of course allowing data to establish the relevance of some models over others does not make economics ideology proof. For example people can always select the one study that suggests that fiscal policy does not influence output and ignore the hundreds that show otherwise. That is why the accumulation of evidence, which includes its replicability, is so important. If you think economics has problems in that respect, have a look at psychology. This is why economists views about the long term impact of Brexit should be treated as knowledge rather than just an opinion. Here knowledge is shorthand for the accumulation of evidence consistent with plausible theory. Sometimes the theories are common sense, like making trade more difficult will reduce trade. Estimates of the size of trade reduction based on evidence are uncertain, but they are better than estimates based on wishful thinking. Empirical gravity equations consistently show that geography still matters a lot in determining how much is traded. Finally there is clear evidence that trade is positively associated with productivity growth. To say that all this has no more worth than some politicians opinion is ultimately to degrade evidence and the science which interprets it. I’ve read a number of people say, observing the lack of growth of UK exports, that this illustrates how depreciations have little impact on trade flows these days. This is a classic case of reasoning from a price change. I think the phrase ‘never reason from a price change’ was popularised by Scott Sumner, although I got it from Nick Rowe. The depreciation of sterling happened because of Brexit. Some of the depreciation might have been a result of the expected cut in UK interest rates, which means it should be temporary. The rest was to compensate for the impact of Brexit on UK trade. In both cases, therefore, exporting firms in aggregate get a temporary boost to their competitiveness (or profitability of trading), which will come to an end when interest rates rise again or Brexit actually happens, perhaps imposing tariffs or other costs that reduce competitiveness. The temporary boost to competitiveness/profitability will be good for firms that already compete in overseas markets. But I learnt many years ago when I estimated aggregate trade equations that a lot of the effect from a depreciation comes from firms trading in new markets that they had previously considered unprofitable. To do that requires some investment: in distribution and marketing, for example. A firm is unlikely to make that investment if the gain in competitiveness is temporary. As tariff changes are perhaps likely to be more permanent than exchange rate changes, this may also help explain the puzzle discussed here. This argument apart, one other thing you quickly learn if you monitor aggregate trade is how erratic it is. We will not know for sure what the impact of the Brexit depreciation has been until well after Brexit itself. This is not a one-off, some kind of soon to be forgotten nightmare. I have argued that the 2015 general election was very similar. What I call mediamacro continues to represent austerity as economic common sense, and it represents the government as if it was equivalent to a household. We are now having to tell our students to ignore what they hear in the media. This is not about individual economists learning media skills. It is about having a collective voice that can, at the very least, speak up for the consensus when it exists. In the UK the Royal Economic Society (RES), rather than the Observer newspaper, could organise polls of academics on key policy issues to establish when a consensus exists. This is better than relying on the selective surveys that already exist. A few angry letters from the RES to the BBC are not enough. We need to force the BBC to defend what they did publicly. If they say they fairly represented academic opinion, we should challenge that by looking at the data. We need to start defending economics, because I do not think anyone else will do it for us. I got some stick on twitter the other day for my (longstanding) view that economics is in many respects like medicine. It is of course not exactly like medicine: as the man said, economics is an inexact and separate science. But think about what most doctors spend their time doing. They are in the business of problem solving in a highly uncertain environment in which they only have a limited number of clues to go on. They have solutions to a subset of problems that work with varying degrees of reliability. If you read Dani Rodrik’s book Economics Rules (which if you have not you should, and can the person who borrowed my copy return it please! ), you will see that economists have a large number of distinct models, and the problem that many economists spend their time solving is which model is most applicable to the problem they have been asked to solve. Where doctors have biology as the underlying science behind what they do, they also rely on historical correlations to see if the science is appropriate. Think about solving the problem of why there had been an increase in lung cancer in the middle of the last century. The science for economists is microeconomic theory, now enriched by behavioural economics. Most of the models economists use are derived from this theory. But as Rodrik emphasises, the trick is to know which model is applicable to the problem you have been asked to solve. To help solve that problem, economists, like doctors, want data. Many have observed how journal articles are now more likely to be about investigating data than establishing theoretical results. Economists have recently started adopting the terminology of medicine in economic studies, talking about treatment effects for example. We both do controlled trials (for economists, mainly in development economics). Sometimes the paths of the two disciplines cross (as they do all the time, of course, in health economics). One of the big empirical discoveries of recent years has been by Case and Deaton, looking at mortality rates of the US white population. Here is a key figure from their 2015 study. 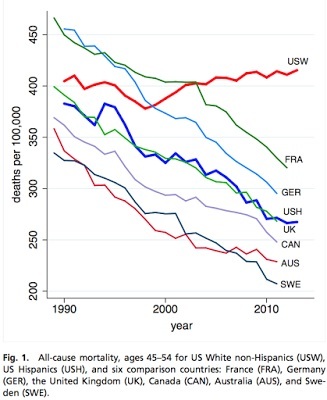 Mortality has been falling steadily almost everywhere, except since just before 2000 among US whites. Focusing just on the US, the problem seems to be mainly for non-college educated whites (this graphic comes from here). As with anything to do with race and class in the US, this work has been controversial, but some excellent analysis from Noah Smith shows that the problem suggested by the data is real enough. Case and Deaton have a new study which tries to understand why this is happening. They describe it as evidence of ‘deaths of despair’. In each age cohort among this group, deaths from suicide, drug overdose or alcohol have been steadily rising. Some useful data is shown here. The interpretation the authors give for the despair is the decline in economic circumstances and status of the white working class in the US. Of course individual doctors make mistakes all the time, but the profession as a whole can make major mistakes. It is of course subject to pressures from individuals and large organisations (drug companies). In this, again, it is like economics. Consider this chart, taken from Alan M. Taylor, ‘The Great Leveraging’, NBER WP 18290. The blue line shows the percentage of high income countries experiencing a financial crisis each year. Crises were endemic until after WWII, when it appeared for two decades or more that they were a thing of the past. In the 1980s they returned, but without any major impact on high income countries. Then there was Japan’s lost decade, and plenty of papers were written about how that was a particularly Japanese problem. The 2000s seemed quiet, and some called it the Great Moderation, until the global financial crisis arrived. Looking at this chart, it is hard to believe that economics, that prides itself on its empiricism, could have made the mistake of believing that now things were different. But economics, like medicine, can make big as well as small mistakes. The point I want to make here is the different nature of the response to these mistakes from outside these disciplines. No one says that medicine has failed us, and we need to find fresh voices. No one will say that ‘mainstream medicine’ is in crisis, and we need to look at alternatives. They do not say that because it would be stupid to do so. With the opioid epidemic something has gone very wrong and it needs to be corrected, and the same is true for economics and the financial crisis. So why the overreaction when it comes to academic economics? One reason is that doctors are not generally asked how long people will live, and even when they do their forecasts are not published almost every day in the press. Most economists are as honest as doctors would be about that kind of unconditional forecasting, but it suits the media to appear shocked and surprised when things go wrong. Another reason is that ordinary people can see doctors doing good things all the time to themselves, their friends and families, but the work of economists is felt less directly. It also seems intuitive that medics are in some sense better than economists, although how you could measure that I do not know. Both factors may explain why medicine is internally policed to a large degree (doctors can be stopped from practicing), whereas economics is not. Another big difference involves politics. Economists bring unwelcome news to both left and right, so it suits both sides to occasionally bash the discipline that brings the message. We have seen a great deal of that from the right over Brexit. For the left more than the right there are also non-mainstream economists who have an interest in arguing that the mainstream has been corrupted by ideology. Quite why so many on the left choose to attack mainstream economics rather than use the mainstream to attack the right I do not know. All I do know is that they have been doing it for 40+ years, as I remember being told by many economists that the mainstream was fatally flawed back in Cambridge in the early 1970s, which was before Thatcher and Reagan. But these differences should not obscure the similarities between economics and medicine. We both deal with people, and their mind and body can be pretty complicated whether as individuals, or as a society. In some areas we have developed quite detailed degrees of quantitative understanding that allow us to make successful interventions (more so than in other social sciences I suspect). In other areas we do things that work most of the time but sometimes fail, but there are many important areas where if we are honest we do not have any real idea of what is going on. So we make mistakes, which can sometimes be extremely costly for huge numbers of people, but we also learn from these mistakes.